It is very common for an IT organization to manage system performance in a reactionaryfashion, analyzing and correcting performance problems as users report them. Whenproblems occur, hopefully system administrators have tools necessary to quickly analyzeand remedy the situation. In a perfect world, administrators prepare in advance in orderto avoid performance bottlenecks altogether, using capacity planning tools to predict inadvance how servers should be configured to adequately handle future workloads. 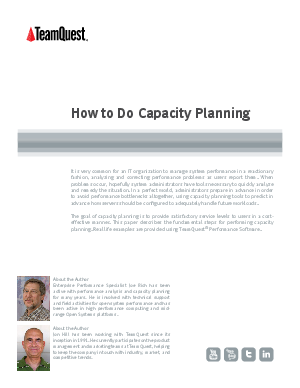 The goal of capacity planning is to provide satisfactory service levels to users in a costeffectivemanner. This paper describes the fundamental steps for performing capacityplanning. Real life examples are provided using TeamQuest® Performance Software.